Objective To determine whether the author’s 20.9 lb (9.5 kg) carbon frame bicycle reduced commuting time compared with his 29.75 lb (13.5 kg) steel frame bicycle. Setting Sheffield and Chesterfield, United Kingdom, between mid-January 2010 and mid-July 2010. Participants One consultant in anaesthesia and intensive care. Main outcome measure Total time to complete the 27 mile (43.5 kilometre) journey from Sheffield to Chesterfield Royal Hospital and back. Results The total distance travelled on the steel frame bicycle during the study period was 809 miles (1302 km) and on the carbon frame bicycle was 711 miles (1144 km). The difference in the mean journey time between the steel and carbon bicycles was 00:00:32 (hr:min:sec; 95% CI –00:03:34 to 00:02:30; P=0.72). 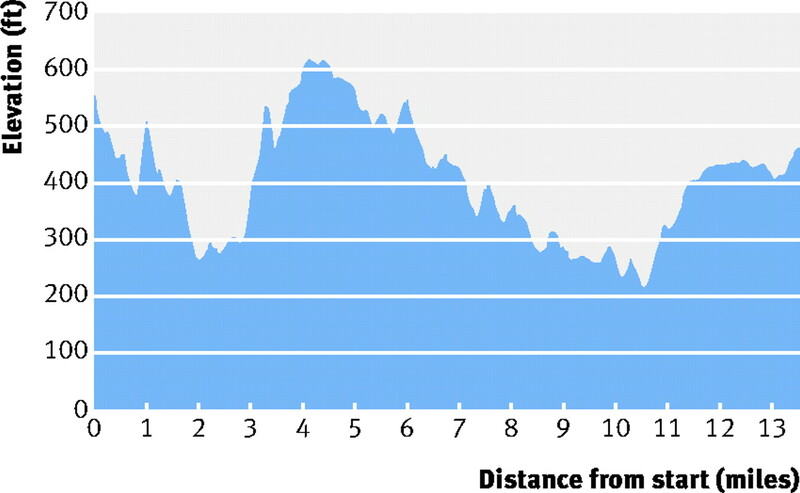 Conclusions A lighter bicycle did not lead to a detectable difference in commuting time. Cyclists may find it more cost effective to reduce their own weight rather than to purchase a lighter bicycle. I have always been keen on cycling. As a child in the 1970s, a student in the 1980s, and a junior doctor in the 1990s, my prime means of local transport was a bicycle. An accident, shortly after taking up a registrar job in Sheffield, wrote off my bike and led me to turn to the internal combustion engine. However, after a number of years as a consultant, peer pressure and the desire to improve my fitness led to a decision to return to the saddle. I acquired a secondhand steel frame bike for £50, spruced it up, and set off. I soon got into the swing of cycling the 27 miles (43.5 kilometres) from home in Sheffield, United Kingdom, to work in Chesterfield and back, managing it most days when I wasn’t on call and didn’t have commitments off site. After about six months of commuting I began to wonder whether the one way journey time of about 55 minutes could be reduced. Those in the know suggested a new bike could knock 10% off it. Evidence based cycling is not high on the bicycle salesman’s agenda. No one will tell you how much more efficient one bicycle is over another; they just say it is better. Making a decision on what was perceived to be best and dreaming of extra time in bed, I looked into the UK government’s Cycle to Work scheme. This scheme allows an employee to purchase a bicycle (up to a cost of £1000 (€1180; $1560)) at a significant discount by using tax incentives, provided the bicycle is used for commuting to and from work. 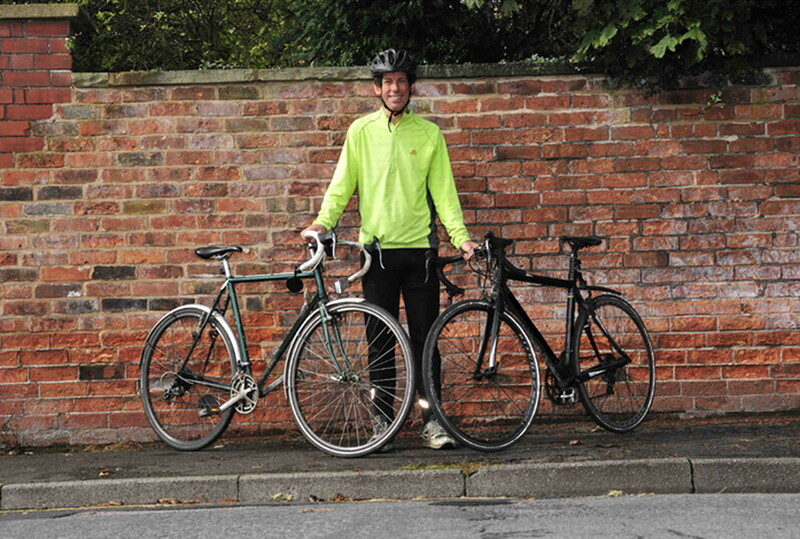 The initiative aims to “promote healthier journeys to work and reduce environmental pollution.”1 However, doubt has been expressed in the popular press regarding whether the new generation of middle aged men in lycra (MAMILs) are actually using their scheme funded bikes to commute or just to gum up the roads (particularly hills) at weekends. The benefits are debatable but attractive, and the scheme has encouraged a lot of people to spend a lot of money on high end bicycles. I purchased a bike at the top end of the cost allowed by the scheme and opted for a carbon frame because it was significantly lighter than my existing bicycle’s steel frame. The wheels were lighter and tyres narrower too. All were factors that made me believe that the extra £950 I had spent would get me to work in a trice. My new bike seemed wonderful, if somewhat uncomfortable. I didn’t notice a dramatic decrease in commuting time, nor did the cycle computer I had fitted to my new bicycle to record any notably swift journeys. But, one sunny morning, I got to work in 43 minutes, the fastest I could recall. My steel bike was consigned to a corner of the garage to gather dust—until I had a puncture. The next day I was back on my old steel bike. I fitted the cycle computer, set off . . . and discovered I had got to work in 44 minutes. “Hang on,” I thought, “was that minute worth £950 or was it a fluke?” There was only one answer: a randomised trial. I toyed with the idea of blinding it but, in the interest of self preservation and other road users, decided against it. This was a single centre, randomised, non-blinded trial; n=1. Both bicycles were of traditional “road” construction with drop handlebars, although the frame of one was made of steel and the second carbon (table 1⇓; fig 1⇓). Identical lights and fittings were used on each bike. Between mid-January 2010 and mid-July 2010, either the steel frame bicycle (29.75 lbs (13.5 kg)) or the carbon bicycle (20.9 lbs (9.5 kg)) was randomly allocated for my daily commute according to the toss of a £1 coin. The time the bicycle was moving for the 27 mile (43.5 km) round trip was recorded with a Sigma BC906 bicycle computer. The clothing worn was determined by the weather conditions on the morning of travel. Water was not carried. The journey, predominantly on urban A roads, included 0.62 miles (1 km) of dual carriageway, 1.86 miles (3 km) of country lanes, and 328 feet (100 metres) of farm track. The total ascent for the round trip was 2766 feet (843 metres; fig 2⇓). The journey times were entered into Calc, a spreadsheet in the Open Office Suite. Times were compared using a two tailed Student’s t test. 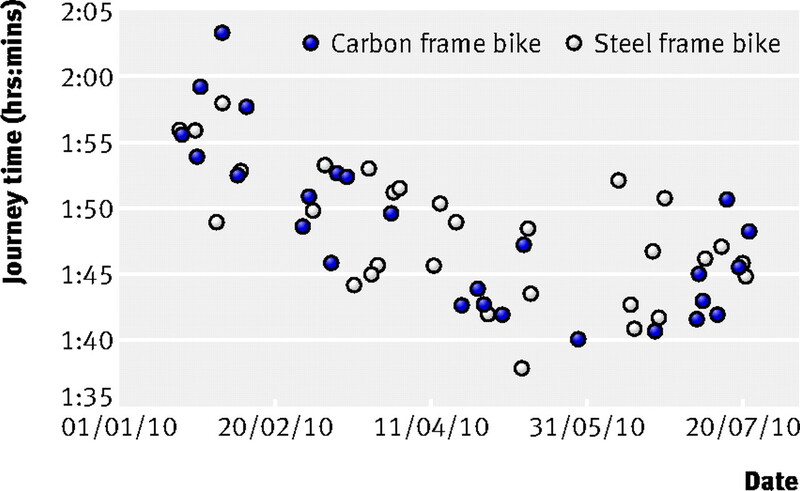 A total of 30 journeys and 809 miles (1302 km) were travelled on the steel frame bicycle during the six month study period, compared with 26 journeys and 711 miles (1144 km) on the carbon frame bicycle (table 2⇓). Two journeys on the steel bike were excluded owing to punctures. One journey on the carbon bike was excluded after an offer of a lift home with a colleague. The top speed achieved was 36 mph (58 kph) on both bicycles. The slowest journey was on the carbon bike in heavy snow (2:03:20 hours:minutes:seconds). The fastest journey was on the steel bike (1:37:40) and was as a direct result of chasing one of my fitter cycling colleagues to work (fig 3⇓). The average journey time on the steel frame bicycle was 1:47:48, and the average journey time on the carbon frame bicycle was 1:48:21. The difference in the mean journey time was 00:00:32 (95% CI –00:03:34 to 00:02:30; P=0.72). The difference in weight between the two bicycles is 8.85 lb (4 kg), whereas the rider weighs the same at 167.6 lb (76 kg). The energy expended on lifting the steel bike and rider through 2766 feet (843 metres) is about 740 kilojoules, compared with about 706 kilojoules for the carbon bike (see web appendix A). The additional energy expended on lifting the steel bike compared with the carbon bike was 34 kilojoules (5% extra). The difference in friction (rolling resistance) between bicycles was 0.2 Newtons. The extra power necessary on the steel bike to overcome this difference was 1.2 watts. The power required to overcome drag on a touring bike—steel, carbon or chocolate framed—at 15 mph (24 kph) is about 170 watts. The difference between the mean journey time in winter (20 January to 19 April 2010) and summer (21 April to 22 July 2010) was 00:06:50 (95% CI 00:04:39 to 00:08:59; P<0.01). The results show that there was no measurable difference in commuting time over 27 miles (43 km) on the carbon frame bicycle compared with the steel frame bicycle. This is at variance to the intuitive assumption that less weight means more speed. Why might this be the case? Though a 30% reduction in bicycle weight may seem large, the reduction in total weight (bicycle + rider) of 4% is much less impressive. The effect this weight reduction has on the forces acting against the cyclist (gravity, friction (rolling resistance), drag (wind resistance), and the force to accelerate bicycle and rider), as well as the effect of the road conditions, need to be considered. Perhaps the most obvious benefit of a lighter bike is that it is easier to cycle up hill. Though the additional energy expended on lifting the steel bike was an extra 5%, the overall effect is less as energy is conserved. Gravitational potential energy gained going up will be converted into kinetic energy going down. Friction (rolling resistance) is relatively small for a bicycle on tarmac and is dependent on the tyre contact area and side wall flex. The manufacturers’ literature implied that both sets of tyres had similar resistance. The extra power necessary on the steel bike to overcome the difference between bikes was 1.2 watts. My brightest bicycle light has a 1 watt light emitting diode. Drag is a factor of considerable importance. It is independent of mass and proportional to the cube of the velocity. The power required to overcome drag on the steel touring bike is seven times that required to overcome rolling resistance. The exponential increase in drag with increase in velocity has the perverse effect of counteracting anything else that may increase the speed of the bike. Acceleration is a little more complex. There are two factors to consider, the force necessary to accelerate the wheel as it rotates and the force required to accelerate the cyclist and the rest of the bike. There is a very good explanation of acceleration on Wikipedia,2 particularly with respect to wheels, where lighter rims can confer a significant advantage, but only if there are a significant number of points of speed change on the journey. There were not enough on mine. There was a statistically significant difference between times in the first (winter) and second (summer) halves of the trial. My summer clothing was relatively tight fitting. Looser shell winter clothing may increase drag by as much as 30%. Another factor that might increase journey time in winter is fear of falling off. When the road is wet or there is the possibility of ice, then the cyclist is more cautious. Winter is also associated with higher winds, and, as all cyclists know, the wind is always against you! Regardless of whether the bike is carbon or steel, you still have to stop at junctions and red lights. Given these findings, why then do so many of us buy “performance” bicycles? Marketing must shoulder some of the responsibility. Many of us respond to “new” pharmaceuticals in a similar way to how cyclists respond to “new” bicycles. The industry invests significantly in marketing products of marginal benefit and we, as medical consumers, frequently buy into the panacea rather than objectively considering the evidence. We must excuse consumerism, particularly at this time of year, because without it our capitalist society would collapse. The purchase of the carbon bike made me feel good, and even though the ride is “harsher” (less comfortable), I still commute on it, especially in good weather. I haven’t compared the brakes but they seem better. Which do I enjoy riding most? Well, after the trial I have to go for the steel bike. I get there as quickly, and it is more comfortable, better value, and has more “character.” If the carbon bike were stolen would I replace it? I’d have to say no. I’d spend the money on high visibility low drag clothing and better lights. A 30% reduction in bicycle weight did not reduce commuting time over a distance of 27 miles (43.5 km). A new lightweight bicycle may have many attractions, but if the bicycle is used to commute, a reduction in the weight of the cyclist rather than that of the bicycle may deliver greater benefit and at reduced cost. I thank C Cooper and H Spencer for their helpful comments and R Groves for proofreading the manuscript and checking the maths. Funding: The study was entirely funded by the author and the author has no commercial relationship with any bicycle manufacturer or commercial cycling enterprise. Competing interests: The author has completed the Unified Competing Interest form at www.icmje.org/coi_disclosure.pdf (available on request from the corresponding author) and declares: no support from any organisation for the submitted work; no financial relationships with any organisations that might have an interest in the submitted work in the previous three years; and no other relationships or activities that could appear to have influenced the submitted work. Ethical approval: Ethical approval was not obtained as the sole investigator and subject was the author. The research was conducted on his regular journey to and from work using his normal mode of transport. Department for Transport. Cycle to work scheme—implementation guidance. 28 October 2009. http://www.dft.gov.uk/pgr/sustainable/cycling/cycletoworkguidance/. Lance Armstrong. It’s not about the bike: my journey back to life. Yellow Jersey, 2000.